During our journey to the Holy Land with Catholic Women’s League of Canada members in July, we visited some places that Pope Francis had visited during his pastoral visit to the Holy Land from 24-26 May 2014. It was special to follow in his footsteps, praying where he prayed and hearing the stories of people who had encountered him. I thought I’d give you a taste of it through pictures. Jordan River: We visited the Baptism site on the Israeli side of the Jordan River, where Pope Francis prayed and met with refugees, the sick and disabled. At this place, we renewed our baptismal vows. Bethlehem: His Holiness Francis stopped spontaneously at the wall separating Israel and Palestine and silently prayed. We also took a moment to pray at this spot. Church of the Holy Sepulchre: Pope Francis met with Ecumenical Patriarch Bartholomew on the occasion of the 50th anniversary of the meeting in Jerusalem between Pope Paul VI and Patriarch Athenagoras, their predecessors. Western Wall: Pope Francis prayerfully placed intentions in the wall and embraced his Argentinian friends, Jewish Rabbi Abraham Skorka and Muslim leader Omar Abboud. We also offered our prayer intentions here. Upper Room: Before leaving the Holy Land, His Holiness celebrated Mass in the Upper Room. We prayed together in this room, where the Last Supper took place and where the Holy Spirit descended upon the Twelve Apostles at Pentecost. During our pilgrimage to the Holy Land with Catholic Women’s League members from Canada, we met a unique group of Hebrew-speaking Catholics in Israel. They make up a small but important community. The leader of this community is Rev. David Neuhaus, the patriarchal vicar for Hebrew-speaking Catholics. Father Neuhaus has an interesting background. He grew up an Israeli Jew and was baptized Catholic at age 26. Four years later, he joined the Jesuits and became a priest. Father Neuhaus spoke with us about the reality of Hebrew-speaking Catholics in Israel. After Israel became a state, people began to immigrate there in the 1950’s. You would assume that all these people were Jews. But the church in Israel began to notice that some of these people came to church on Sunday looking for a Mass! Thousands of Catholics came to Israel with their Jewish spouses and families. They all spoke Hebrew. Father Neuhaus says this was something of an anomaly — Hebrew was the language always associated with the Jewish religion and Christians never used Hebrew. The challenge at first was making Hebrew a Christian language — Mass, prayers, theology and catechism in Hebrew. Overall, that was quite successful. The biggest difficulty has been transmitting the faith to Christian young people in a place where Jews are the majority. These children live fully immersed in secular Jewish society with no signs of Christianity anywhere. Many marry Jews and never come back to the church. So one of the church’s main focuses is children and youth ministry. One of the aims of this church is to build unity among Arabic-speaking Christians and Hebrew-speaking Christians, and also to foster reconciliation among Christians and Jews. In its humble way, the vicariate is taking one step at a time to do just that. This Hebrew-speaking vicariate also has a special outreach to the migrant population of Israel. Father Neuhaus is also the coordinator of the pastoral care for migrant workers and asylum seekers. This includes workers mostly from Asia, including Filipinos, Indians and people of other nationalities. Many of these workers care for the children of the Jewish people, along with the elderly, the sick and the handicapped. The vicariate provides them with a space for community and Masses in their native languages. The children of these migrant workers end up going to school in Israel and learning Hebrew. These children also require support to nurture faith. There are also asylum seekers who come from Africa — mainly Eritrea and Sudan. Unfortunately, Israel rarely grants refugee status to asylum seekers, so these people live in limbo. Good priests, nuns and pastoral workers do their best to care for this community’s needs. During the sign of peace, it began with the presiding priest, since the priest represents Christ. He shook hands and it moved through the congregation from the front row to the back row. It was interesting symbolism — peace starts with Christ, and he spreads his peace to everyone. Another detail was that they used matzo (traditional unleavened bread) instead of the regular white hosts that we use in North America for the Eucharist. Finally, they gave us books and we sang with them and prayed the Mass parts in Hebrew. No, we didn’t learn Hebrew in a day — but we used books where Hebrew was transliterated into English to make it easier to follow. The music was beautifully performed by their seminarian Benny. One thing that Father Neuhaus said stuck with me. I will try to take it to heart. He said that having a hard life doesn’t mean that you will not find someone who has an even harder life than you. So please reach out to them, open up and be generous towards those who have less than you. 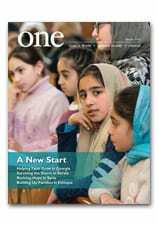 Read more about the Hebrew-speaking vicariate in this article in ONE magazine. We had an amazing visit to the Holy Land recently, joined by members of the Catholic Women’s League. I’d like to share with you some stories of our visit. On 3 July 2014, our group was privileged to visit and speak with current mayor of Bethlehem, Ms. Vera Baboun. She is the first female mayor of Bethlehem, the birthplace of Jesus Christ. Our group was mainly composed of women leaders from the Catholic Women’s League in Canada, so it was a unique experience to visit the mayor, herself a Catholic woman and a leader. As a widow and mother of five children, Ms. Baboun has experienced great hardship in her own life. But this perspective helped her to focus on the blessings that come from and with such difficulties. She also spoke about different injustices that the Palestinian people face due to the conflict with Israel — for example, water shortages, ongoing confiscation of property and limits on people’s movement. As a minority group, Palestinian Christians are also often caught in the middle of conflicts between Jewish and Muslim populations. We can keep the Star of Bethlehem burning by sharing the story of the “living stones” — the Christians of the Holy Land. They keep the faith alive and bear their cross every day. She urged us to please carry the cross of Bethlehem with us wherever we go. We left inspired and touched by her words.